Most of our friends are in baby mode this year. They’ve either just had a baby, are currently expecting or are hoping to be soon. Because of this, I’ve thrown my fair share of showers and have purchased more onesies than I ever imagined I would. Recently, I came up with a special gift for the busy mom and dad to enjoy now, and the baby to (hopefully) appreciate one day down the road. When I get word that parents-to-be are rushing to the hospital or have given their midwife a call, I head right to the newsstand. There I make sure to pick up a copy of that day’s New York Times and a few other periodicals. 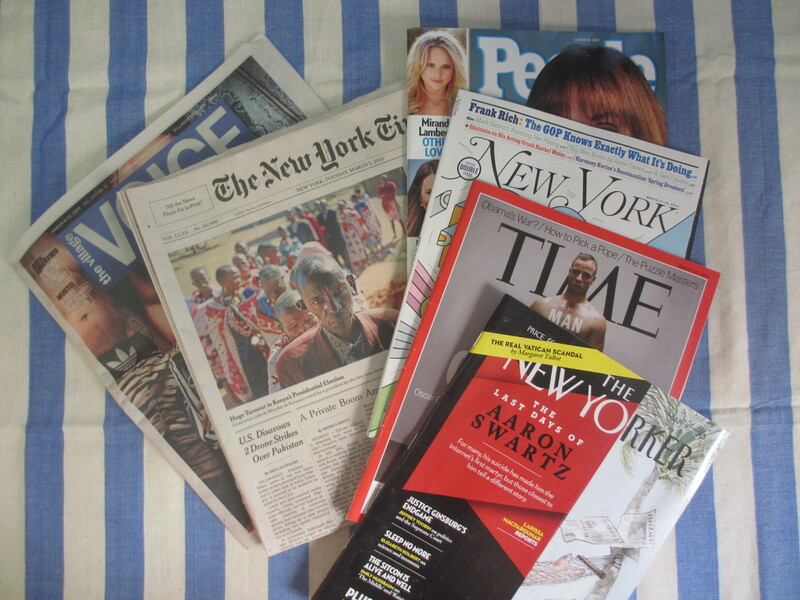 A recent collection I put together also contained that week’s edition of the Village Voice and the current issues of The New Yorker, Time, New York and People. I put everything together in a decorative box and hand it off to the parents long after the excitement and craze of the birth has calmed down a bit (usually when the baby is 5 to 6 months old). My hope is that the baby will one day enjoy this memento as a small peek into what the world was like the day and week he or she came into this world. To make the box below, I covered the outside of a decorative book-shaped box (purchased at T.J. Maxx) with a very light coating of spray paint. I then used Mod Podge to affix and seal pictures and passages from old Beatrix Potter books to it. The baby’s name was partially inspired by the classic author, so it seemed it would be fitting to incorporate that information into the gift. The box had plenty of extra room inside, so I suggested the baby’s parents use it as a place to store the cards they received just after their new daughter was born. Hopefully, this keepsake will be tucked away on a shelf somewhere and given to Baby B when she is old enough to enjoy its contents. SWWU Tip: You should customize your box and newsstand selections to the family you’re purchasing them for. Other great additions might include hometown newspapers, church bulletins or other magazines. This entry was posted in For Our Friends and tagged @SWWUblog, baby, Baby Shower, Beatrix Potter, birth, crafts, DIY, expecting parents, for our friends, gift, magazines, mod podge, Peter Rabbit, the new york times, unique baby gift by Something We Whipped Up. Bookmark the permalink.